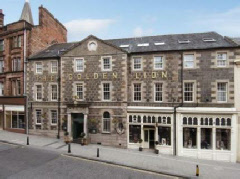 Should you stay at the Golden Lion and partake of a tipple in its Library Bar, you’ll be where Robbie Burns is reputed to have etched the poem Stirling Lines on one of its window panes. Alas, it is said that he returned a few weeks later and smashed the piece of glass with a riding crop, so that now nothing remains apart from the legend. Unfortunately, while the hotel asserts that it has been “patronized by royalty”, little information relating to who and when is available. Whatever the truth, though, it is certainly a landmark in Stirling, having been welcoming guests since opening in 1786. More details for the Golden Lion to be uploaded soon.